SHOCKING TRUTH: Silver Labradors – Purebred or Not? Has anyone else wondered about these new “designer” colored labs??? Are these Silver Labradors purebred? Are they not? The general notion seems to be that they are rare and desirable… I’m not quite sure I get the appeal but I certainly have numerous people ask me if I have any. The answer to that question is no, we only breed yellow, black, and chocolate. The AKC only recognizes those colors as well. My fear with people breeding so purely for color is that it’s at the expense of perhaps health and temperament. I did, however, find this GREAT article written by the Labrador Retriever Club, Inc. which seems to thoroughly explain the mystery behind silver labs. It’s really fascinating! And in my opinion, is the most logical sounding argument I’ve heard yet. But enough of my opinion, visit the link below and judge for yourself! Thanks for posting this. I wondered where that color came from. is this any different than the “hot new breed” of labradoodles? all these cross bred dogs that people are paying top dollar for? i think mutts are great, but paying top dollar for them is a real mystery to me. You have to be weary of the labradoodles, as many people people will take their labs that don’t pass clearances and breed them to poodles… Not all are like that, necessarily, but I would be cautious. I agree! When people ask me about these crosses that is what I tell them. You are paying an exhorbitant amount of money for a mutt. Go to a shelter and save a mixed-breed dog’s life for goodness sake! Or, spend your money on a quality Poodle or Labrador. I bought a black lab pup 18 months ago that had 5 generations of silver lab in his bloodlines. He was diagnosed being fear aggressive . We recently had to uthanize him for biting children & strangers. I would never buy another lab that had silver in their bloodlines. You are incorrect. AKC does in fact recognize the silver Labrador as a breed. Agree with you RB. People that don’t get it obviously haven’t seen chocolate and yellows breeding to learn. The AKC might recognize them as chocolate labs it they are truly unique and I personally own one. His parents are both silvers and I can attest to the gentle nature of the breed as can anyone else that’s own a lab! AKC does NOT recognize silver as a color in Labs and never will. Armatures. Labradors are recognized JUST not the color variation. Do none of you know the history of labs?? Chocolates went through this same thing. This is solely standard breeder envy or jealousy because silver labs are so beautiful. Period. It has been proven over and over through DNA that they are pure. Please read on genetics before you sound as ignorant as you do. Anyone who thinks they are mixed especially with Weimaraner, are just simply not dog people. This color controversy is not limited to just labs. Colored bulldogs are not recognized or able to show either but are very much bulldogs. In silver labs AKC only lists them as choc because of the variation of silver. i will agree with you we have a pure bred silver lab and she is just as smart and well mannered as any other lab… and the color is beautiful ! You must have a silver Lab. When I was young, I wanted to be a dog show judge. I went to shows, studied the breeds extensively, drew pictures of my favorite breeds, Labradors and Weimaraners among them. Eventually, I instead went into veterinary medicine. Silver labs were virtually unknown and were never produced in Labrador litters before the 1970s. Chocolates WERE, they just weren’t desirable. Silvers have really become popular in the last fifteen years or so. I have seen many at the clinic I work at. I’ve also seen many of the three traditional colors. We had two five-month-old Weim pups in today, a brother and a sister, and we neutered and spayed them, respectively. The first breeders to breed specifically for silver Labs are certainly not spilling their secrets, and they say they didn’t produce them by crossing these two breeds, but I find it awfully suspicious that silvers share traits of both the Weim and the Lab. They may be “pure” lines so-to-speak now, since all of this time has passed (like 40 years), but the gene that causes the silver coloring in Weimaraners is a dilute gene that has wreaked havoc in Labradors. If your silver Labrador is healthy, then you are blessed. Most of the silvers that come into my clinic have color dilution alopecia, which is a skin disorder that shows up in dilute dogs of many breeds. In its most severe form it is painfully uncomfortable and even causes open sores, but generally it just makes their hair fall out and their skin a little itchy. That being said, I don’t think there’s anything wrong with owning a silver Labrador. They are beautiful dogs with wonderful temperaments and they make great family pets. I’ve even known a few who were duck dogs, as well as a few who were used as upland game bird dogs for…hmmm….pointing. I just find it incredibly frustrating that breeders will charge ridiculous amounts of money for a puppy that could quite possibly be a mix, and is even more likely to be a walking vet bill. Silver Labrador isn’t a breed in itself….they are Labradors and silver is only the color variation. I have a 1 year old silver lab. She is beautiful and does not have an aggressive bone in her body. In fact, she is very gentle and at times timid. Molly is the absolute perfect family dog. I have a male Silver Lab and he is the best dog we have ever owned. His temperament, disposition,personality. He had a calling to be a therapy dog. He loves it, loves the people as they all love and adore all 100 lbs of him. No he is not fat, went to the a week ago and got all shots and he is good as ever could be. He is the best dog no matter what. I love all 4 of my dogs! Our Silver Lab, Nattie, is 10 months today..62 lbs. She is healthy, loves to be outdoors, loves to sleep prefers to do it nuzzled up to me or my wife. She always needs to be touching us when she sleeps, which I think is awesome, with her paw or by resting her head on us. Our friends have a 90lb Rottweiler, a shitzue, and a charcoal lab and they all get along great. I’ve been explaining this similar however was unaware of the champagne but it makes sense. That’s why AKC sees them under their dorminant of the 3 recognized colors. Thanks for posting and providing the info to all the Nay-Sayers that call them half breeds. All I know is my silver is the best Lab I’ve ever owned. C’mon people – are ya kidding me? I’ve yet to read a more anecdotal set of opinions on why their view is right & the other side is “bad” (jealousy vs crossbreeder V’s haters) . Hasn’t anyone here looked at the 100+ year old pictures of what labs used to look like? It was mostly black with white chest & feet. Does anyone dispute that all dogs are inbred to get the various characteristics that modern day dogs have? Some labs are white or yellow or red-ish yellow (call it Fox-red if you like) or black or brown or light taupe (call it blue or champagne silver if you like) and EVERY color will manifest smart or stupid or shorter or taller or thinner or thicker varieties, or aggressive or timid or anxious or mellow personalities. Quit saying YOUR side is right because of your doctor’s degree or your 5 decades of breeding …. or because YOUR side has swell/convincing web pages. Both sides have “proofs” and both sides have a monetary stake at stake. We throw the words”mut” & “inbred” and such just like we insult different human characteristics …. because we wrongly think it makes our view better/right. We’ll all be gone soon enough, as well as will our beloved pets. If it didn’t matter 200 years ago …. and if it won’t matter 200 years from now …. then it really doesn’t matter. Now please – go hug your dog. You are right Gary. Now shut-up and sit down. We have a beautiful 4 year old Silver Lab. She is just like any other lab, acts like any other lab and we wouldn’t trade her for the universe. Such a crock of BS that people spew about them. Makes me sick but then I have to remember the world is full of ignorant people..
A lab is a lab and the color of their coat won’t change that. My silver lab pup (diluted chocolate lab if you must) is all lab. Kind, well tempered, obedient, smart and athletic. Gods perfect creation. So stop the nonsense and divert your negative energy to something more important. I’m sorry, these beautiful dogs are OBVIOUSLY Weimaraner mixed with labs! Never in any dog shows (AKC registered) that I’ve been a part of showing Weimerainers, has recognized this breed. They are beautiful dogs. Fear and separation anxiety can cause this breed to be aggressive without proper training, that must be closely attended to. No they are not – you are wrong. Silver Labs are full-blooded Labrador Retrievers that have been specifically bred for the very light brown coat that resembles a ‘silver’ color. You don’t see them in shows because it is a dilute characteristic that the AKC does not want to recognize as valuable. I’m surprised to hear such an ignorant comment from someone that has shown dogs – do your research before commenting. YOU are wrong. Silver labs are Weimaraner mixes, it is so glaringly obvious. The only recognised Labrador colours are yellow, black and chocolate. 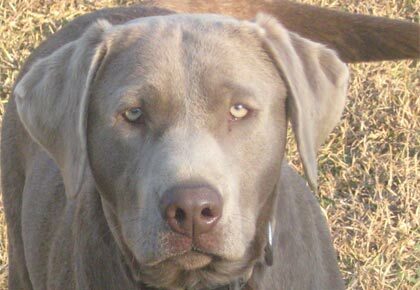 Silver labs have the obvious Weimaraner eyes and coat. You idiots who keep insisting on this fallacy that silvers are true labs can keep dreaming about the day that they will be accepted by the top kennel clubs. Absolutely ridiculous. Just stop perpetuating these lies. A true Labrador breeder knows the truth and knows better. Shame on you con artists selling these dogs to the clueless public. Shame on you. a Weimaraner convinces me that you have no knowledge of breeds and you probably don’t accept the fact that all dogs were derived from wolves, coyotes, dingos, and so on. Talk about being an idiot you take the cake. About ANY dog is smarter than most humans. 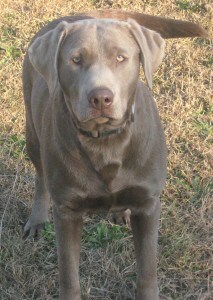 I have a silver lab, Jax, he is two years old. He is beautiful and great tempered.. he also has many health issues, juvenile cataract at 6 months old, so he is mostly blind in one eye. Also he is in and out of the vet for skin conditions , hair loss and at the moment swollen red paws the vet says is due to allergies but no one seems to have answers. The breeders I got him from no longer exist or have a website because I would love to contact some of the owners of the other pups in the liter. I need answers so my dog can at least be healthy more often and not on medicine everyday of his life. He’s only 2 years old!! I have a charcoal lab, Storm. He’s 9 months old. To all of you insisting that the dilute gene comes from a Weimaraner, could you please reference where you got your “proof”? Where is this official information that’s been published? If you are so certain that they are a mix why hasn’t this stupid argument ended? The problem–they cannot prove there is Weimaraner genes in a dilute lab….and with today’s science it should be literally no problem to locate their genetics if they are present. So explain that to me, please….enlighten us all. not realizing they are just lining the pockets of corrupt breeders. Sorry, but do your research. Sorry Sandy but you are wrong…..and the LRC would have said the same about Yellows and Chocolates a few years back. in the Lab family and the sooner you and the “torch and pitchfork” crowd accept it the better. I recently said goodby and put my 14 year old silver lab down. His temperament and personality was incredibly sweet, loving and playful. I have owned many akc labs before him and he was by far the most interactive and healthy dog to date. Akc gives little meaning to me know. Genetic drift in the gene pool is safer than over breeding within the gene pool. Whatever breed was sliced to make silver labs.. keep doing it! I have one yellow lab and one silver lab. I made the dna test to the silver and is a 100% pure lab. She is amazing, very smart and she is a candidate to be an amazing service dog. The yellow lab is amazing too he is a son of a champion but he is not even close smarter then my silver. About the price its not true the yellow lab cost me more then my silver. I dont know how the peoplo who dosent have a silver lab can talk about is a mix. My 2 dogs have the same behavor as a real lab its not different betwen them. The silver lab are amazing dogs, and i agreed with dennily in every word. Whenever someone says something is the “Shocking Truth” it is always to announce feeble malicious lies. At one time Lab purist dismissed Chocolate and yellow, some still only breed with Black and Yellow gene dogs. My silver is a better Lab than most of those, A Silver Lab is a Chocolate with a dilute color gene which is perfectly fine, but stupid people used to cull them. Now they are here to stay. Yep, “My dog’s better than your dog” BTW they are nothing like Labradooles and yes they are similar look wise as Weimaraner as both have the dilute color gene and are dogs bred for similar purposes but if you spent time with each you’d know the Lab from Weimaraner. Personally I’d be flattered by the comparison, but when you have people trying to run down your breed you get touchy. Yes Sandy Labs do have the dd gene always have. Black purists tried to cull them out. Get a grip. Purist loose! My Silver has no Weimi sliced into him. Some breeds that went into labs already had it. Yes and explain the grey and silver. Cassie so so for you loss but I would be more concerned about the breeder than the false rumor that Silvers carries a fear aggression gene. I can see a lot more supporters above than sensationalist headline writers. I am not going to read through ALL of the comments, however. I have a silver lab. He will turn 1 on November 30th 2017. He is a gorgeous young boy with an amazing temperament and is so loving.. almost annoyingly so. He was bought as a playmate /companion to our 2 year old Rottweiler. They are inseparable buddies. I had many people ask if the color was wslas gained from breeding with Weimaraners. I was positive so I did something me research. As my boy came with AKC papers. I noticed THE AKC had him listed as ‘chocolate” and while this puzzled me. After me research it made more sense. Silver labs are the result of a double chromosome (I don’t remember which one) that is a pigmentation mutation. And the AKC does in fact, recognize silver labs as chocolate. I did pay more for my silver than any other dog I’ve owned but it was less than $1000. I met the mom and dad. Mom was silver, dad was charcoal. My dog so far has never shown any aggressive behavior of any kind. He is just like any other 1 year old lab..clumbsy, hyper and just a ball of happiness and kisses. I truly feel all of the day Sayers are as others have said..envious they cannot get their hands on good breed stock or simply don’t want to accept the coloration because the desire for these beautiful pups can put a hurt on their own litter selling for inflated pricing. My question is, why does it matter.? I have a black lab and getting ready to purchase a silver. For me, all I care about is their health and that the pup will blend in with my family. I don’t mind paying extra for the puppy that draws me to it, I research for weeks before a purchase. Does it really matter about AKC registration if you don’t plan on breeding or showing the dog? My opinion, not really. I have seen websites for traditional color lab breeders and their destain and upfront disgust for Silver labs, to me it screams anger and hostility and I wonder how difficult it would be to communicate with them about their available pups. Life is too short to worry about such small things, especially since there is enough competition of breeders in those breeds. Honestly, until today, I had never seen nor heard of a sliver. I used to have a chocolate years ago and he was the best friend and companion you could ask for. I am looking for another companion and came across this variation. From the research I’ve done, apparently tests have been done to locate any of the weimeraner genome and it wasn’t found. These dogs are as much “Labrador Retrievers” as much as any other yellow, black or chocolate. It seems that the recessive dd gene (same rececessive gene as found in weimaraners) is now becoming more popular. There also seems to be seven distinct bloodlines that prevent the inbreeding that has been alleged. I do not wish to breed or show the dog I buy, so it really doesnt matter if it says chocolate on the AKC papers. My main concern is the alopecia. Is this a common trait? It doesnt seem so. Will breeders guarantee their puppies against this? I had a german shepherd once that was diagnoswd with demodectic mange and the breeder offered a refund, however, by then, she was a part of the family. I wonder how prevalent this is. As far as temperament, in my opinion, that is more a factor of the owner and is their responsibility. We have a 7 year old female silver lab. She’s our third lab. The first two were chocolates we rescued from a Lab Rescue. They were incredible dogs, but had been neglected and abused and cost us thousands in vet bills. We gave them both a wonderful life and cherished them until they passed. We got Beatrix from a breeder. We thought we’d done our research and we really wanted to have the experience of raising our next dog from a puppy. We love her, but she has been very difficult. She has anxiety, she’s territorial, she isn’t very bright and she has dilution alopecia. We feel so sorry for her. I don’t know if she’s mixed with another breed. I don’t care about that. I do know that the dd issues are real. The other dog we have right now is a 6 year old mutt from a rescue and he’s so smart, healthy, loving. I will never eve get a dog from a breeder again. There are too many dogs who need good homes. And they’re breeding dogs like Beatrix who suffer from gene issues. puppies . I love Labradors and Golden Retrievers best dogs and of corse many other dogs are awesome too.